THE BOOK: Anything That Burns You: A Portrait of Lola Ridge, Radical Poet. SUMMARY: Anything That Burns You is the first full-length biography of the Lower East Side’s Lola Ridge, a trailblazer for women, poetry, and human rights far ahead of her time. Author Terese Svoboda takes the reader on a fascinating journey from Ridge’s childhood as an Irish immigrant in the mining towns of New Zealand to her years as a budding poet and artist in Sydney, Australia, and then to San Francisco, Chicago, and downtown New York. By the 1920s, she was at the center of Modernism, and good friends with William Carlos Williams and Marianne Moore, while promoting the careers of Hart Crane and Jean Toomer and editing Others and Broom, in addition to writing brilliant socially incisive poems. The New York Times declared her one of the most important poets in America in 1941, but Ridge fell out of critical favor due to her impassioned verse that looked head on at the major social woes of society, infused with a radical belief in freedom gleaned from her mentors Emma Goldman and Margaret Sanger. 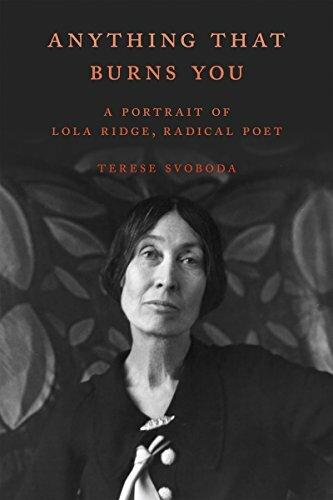 Certain to revive the legacy of a singular artistic figure–– as unforgettable as Virginia Woolf or Frida Kahlo–– this lively portrait gives a who’s who of all the key players in the arts, literature, and radical politics of the time, in which Lola Ridge stood front and center. Radical illustrator/writer Molly Crabapple has written an introduction. THE BACK STORY: I’d never heard of her until Robert Pinsky published an article on Slate about her. The more I researched, the more intriguing she became. It took four years to write. I had received a visiting writer appointment in Hawaii before I had a contract and “swung by” NZ at the very beginning of my research, which was very valuable. WHY THIS TITLE? : “Anything that burns you” is the answer Ridge gave to an English critic who asked what were the proper subjects for poetry.WHY WOULD SOMEONE WANT TO READ IT? At the moment, the political situation worldwide parallels that of the turn of the twentieth century and requires radical thinking and examples from history that give us hope. “Magisterial” said the Washington Post. A story of prejudice, ambition and personal struggle, with Ridge’s long-neglected talent shining through it all.” —John Sayles, twice-nominated Academy Award screenwriter, director and novelist. AUTHOR PROFILE: www.teresesvoboda.comA Guggenheim fellow, Terese Svoboda is the author of 18 books, including seven books of poetry. Professor Harriman’s Steam Air-Ship (poetry) is her most recent. Anything That Burns You: A Portrait of Lola Ridge, Radical Poet (biography) appeared in paper in 2018, and Great American Desert (stories) will be published next year. She has won the Bobst Prize in fiction, the Iowa Prize for poetry, an NEH grant for translation, the Graywolf Nonfiction Prize, a Jerome Foundation prize for video, the O. Henry award for the short story, a Bobst prize for the novel, and a Pushcart Prize for the essay. She is a three time winner of the New York Foundation for the Arts fellowship, and has been awarded Headlands, James Merrill, Hawthornden, Yaddo, McDowell, and Bellagio residencies. Her opera WET premiered at L.A.’s Disney Hall in 2005. “Terese Svoboda is one of those writers you would be tempted to read regardless of the setting or the period or the plot or even the genre.”–Bloomsbury Review. AUTHOR COMMENTS: The biography reminds us that there are other ways to love and work, to transcend today’s often narrowly defined vision of what makes a committed citizen, a dedicated artist, or a fulfilled life Discovering Ridge’s work and life will be a particular delight for readers of women authors, feminism, and poetry, especially those interested in activist writers. WHERE ELSE TO BUY IT: Indiebound, Amazon, kindle, kobo. Fascinating! So glad to know about this: I’ll read it.